Read our FAQs to find out what to expect during your appointment at Guildford Smiles Dentistry in Surrey. Determining where to seek dental care is a big decision. We are here for you to answer all of your questions about your conditions and treatment. Some of the most common questions we receive are written below. Take moment to read through them. If you do not see yours listed, call us! We are happy to help. Are you going to use a needle? At Guildford Smiles Dentistry, your health and comfort are our top priorities. We know that many people have had a negative dental experience, and we look forward to giving you a positive one in every way. From our caring team to our gentle touch, we are sure that you will feel your dental experience was a comfortable one from start to finish. We always avoid giving injections whenever possible. When we do need to use anesthetic, we allow ample time for it to take effect so that you don’t feel a thing during treatment. We also use topical gel to put the gums to sleep before numbing your tooth. Anesthetic application is done using a variety of techniques to make it as comfortable as possible. Dr. Salman and Dr. Seddik are very good at giving pain-free injections. We also provide sedation for people who are overly anxious or who need additional help getting numb. Anxiety can make anesthetic slower or less effective. Nitrous oxide or oral sedation can relax you so that you have an easier time getting and staying numb. Don’t let anxiety or fear keep you from getting the dental care you need to stay healthy. 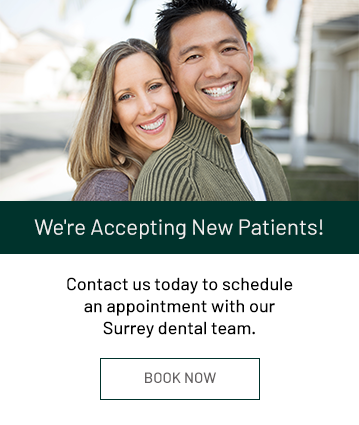 Contact our Surrey, BC dental office today to learn more about how we can help. At Guildford Smiles Dental, we use digital x-rays that require minimal radiation. Digital dental x-rays require 80-90% less radiation than traditional x-rays. It equates to being in the sun for about half an hour. Additionally, digital x-rays are high-resolution and show greater detail than their film predecessors, allowing us to diagnose problems earlier, when your condition is likely to be less complicated and less expensive to treat. We securely store your digital images and can compare them over time to identify any changes in your oral health. We recommend x-rays because they are necessary to see between the teeth and catch areas of decay before they are visible to the naked eye. Usually, if you can see the decay, then the tooth needs extensive and sometimes expensive treatment. Since we only take the necessary x-rays required to monitor your health, you never have to worry about excessive exposure. Unless you experience a dental emergency, we take them about once yearly. Our x-rays are not only better for you, but also better for our environment. We do not need to use film or the chemicals required to develop it. Instead, we store your images in your dental chart for later reference. If you ever have questions about the safety or necessity of any dental treatment, contact our Surrey, BC dental office. We look forward to helping. I don't have cavities. Why do I still need a dental exam? Cavities are not the only condition that you face when it comes to your oral health. We also examine the health of your gums, bone levels, check for a clenching and grinding habit, and provide a potentially life-saving oral cancer screening. Usually if you see cavities or feel pain in your teeth, then it too late to do a simple treatment. Your tooth contains a number of layers, and the center layer, that houses your nerve, is the layer where you would feel pain from a cavity. By that time, you might be facing a root canal or tooth loss. Exams make sure we see problems when they are just starting. At this stage, we may only need to recommend better home care or a small filling to stabilize your tooth. When you skip exams, you are putting your health at risk. An investment in preventive dentistry will save you time, money, and discomfort in the future. Your oral exams are also a great time for you to discuss any concerns you might have about your smile with Dr. Salman or Dr. Seddik. If you would like to make improvements to your smile, learn how to reduce tartar, or find out how to take care of bleeding gums, you will have the time to do so at your dental exam. Can I have dental care during pregnancy? In many ways, pregnancy is one of the most important times to make sure you are taking the best care of your teeth and gums. Changes in hormones can affect the health of your gums and lead to pregnancy gingivitis, a hormone-related form of gum disease. Your oral health is part of your growing infant's health, and regular check-ups should be part of your prenatal care. While we avoid doing elective treatment during pregnancy for your comfort, most necessary dental therapies can be completed safely during pregnancy. We will discuss your conditions and treatment options with you at your appointment so that you have an opportunity to ask any questions you may have. We completely understand that you want the best for you and your baby. Periodontal disease is an infection in your gums that causes inflammation, bleeding, bad breath, and even tooth loss. Periodontal disease during pregnancy has been linked to pre-term births. By addressing any oral health conditions, you are protecting yourself and your unborn child in the best way possible. We know you are busy getting ready for your little one’s arrival! We make maintaining your oral health during pregnancy convenient by offering evening and weekend hours to meet your needs. Can I safely use toothpaste for my child? Fluoride toothpaste and fluoridated water spends a lot of time in the news, and you have probably seen mixed headlines with varying information. At Guildford Smiles Dentistry, we follow the advice of the Academy of Pediatric Dentistry, which recommends that you use a small amount of fluoride toothpaste on your child’s teeth twice daily. When you come to your child’s oral evaluation, we will spend some time discussing ways we can improve home care and habits. Good oral hygiene at home combined with professional dental visits is essential to your child’s overall health. By starting now, at a young age, we give your precious little one the best chance for a lifelong, healthy, and comfortable smile. My parents had bad teeth and lost them early. Will I lose my teeth? Though heritage and genetics play a role in the health of our mouths, the cycle of problems can be broken with good habits and good diet, keeping up with regular dental visits, brushing twice a day with fluoride toothpaste, avoiding sugary drinks and foods, and snacking healthy. Conscientious dental care can help you keep your teeth for your whole life, and it would be our pleasure to help you achieve and maintain a healthy smile. At Guildford Smiles Dentistry, we customize your treatment based on your unique needs. Once you have an oral exam with Dr. Salman or Dr. Seddik, we can customize a treatment plan that will keep you feeling and looking your best. If you have some catching up to do, that may mean more frequent dental visits until your teeth and gums are infection free. If you have a history of decay, we can offer you preventive treatments such as fluoride and dental sealants to protect your teeth. Since your gums are the foundation of a healthy smile, keeping them healthy and disease free is important! Our professional dental cleanings will eliminate tartar, plaque, infection, and stains from your teeth and allow your gums to heal. Bad dental health is avoidable! We will work with you so that you do not have to experience tooth loss like your parents or grandparents. With today’s dental technology and a commitment to your care, you can have your teeth for a lifetime.